Food for this holiday focuses on sweetness. You can use sweet dates, carrots, apples, honey, prunes, maple syrup or dried apricots in stews, meat and vegetable dishes. 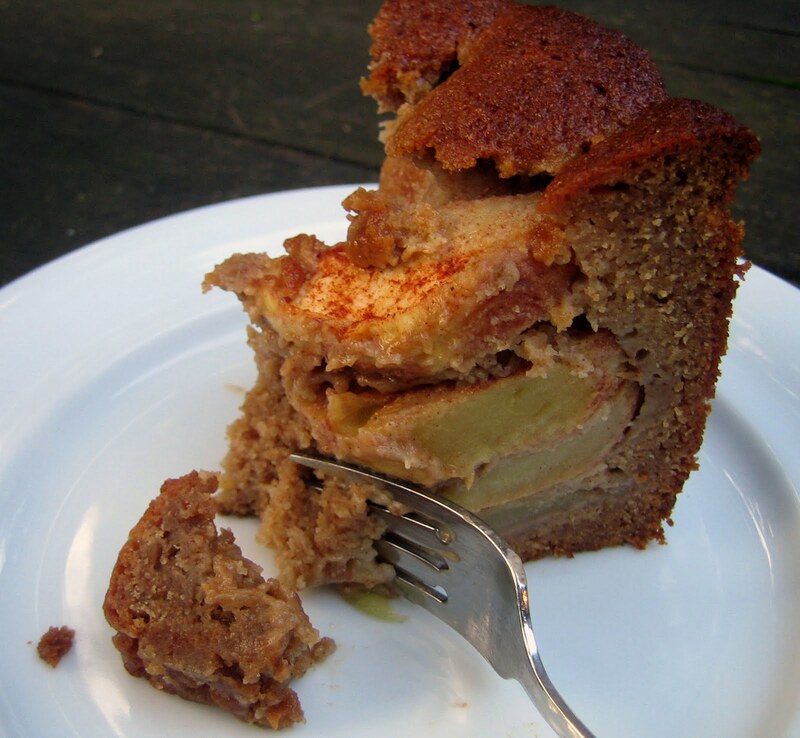 For dessert, apple cake or honey cake are festive choices. While I love apple cake and have baked different versions over the years (always in a happy search for “the one”), I am not the biggest fan of honey cake, even chocolate honey cake. Often, I find honey cake too dry and not a cake I want to indulge in to begin the New Year. Since apples and honey are a natural pairing, I decided to combine these two in a single cake that I hoped would yield dense, moist slices for us to sigh over and savor. Traditional honey cake recipes call for liquids such as coffee, orange juice, whiskey, or a combination of all three. I decided to substitute pear juice and chunky applesauce for these liquids to increase the fall flavors. I also subbed out part of the usual vegetable oil for fruity olive oil. The ultimate addition, though, is layers of apples tossed with cinnamon. Moist and dense? This cake is that, and more. It is a tall, majestic cake that sings of apples and honey, cinnamon and cloves, and sweetness for a New Year. L’Shana Tova! Wishing you a sweet and healthy year. Preheat the oven to 350 degrees. Butter or oil a angel food cake pan. Peel, core and slice the apples into eighths. Toss the apples with 2 teaspoons of cinnamon in a bowl and set aside. In a large bowl, whisk together the flour, baking powder, baking soda, salt, remaining 4 teaspoons cinnamon, cloves and allspice. In another bowl, stir together the oils, honey, sugars, eggs, vanilla, juice and applesauce. Make a well in the middle of the dry ingredients and mix the wet ingredients in. Spoon a quarter of the batter into the prepared cake pan. Place a row of apple slices in a concentric circle around the pan. Spoon in another quarter of batter to cover the apples and place another row of apples on top. Repeat two more times, finishing with the apples. Bake the cake for about 1 1/4 hours. 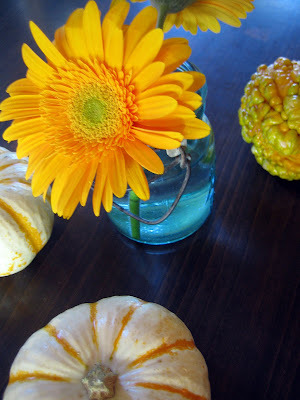 If it begins to brown or darken around the edges too much, place some foil on top. This is a deep, dense cake and you want to be sure it is fully baked. Test in a few areas to see if it is done all over. Let cool completely before removing it from the pan. It is a heavy cake. Slice and enjoy! Oh man, being Jewish comes with some tasty traditions! And, what a great cake. I can't wait to give this a try. I love this! I've always wondered why there aren't more apple-honey cakes to ring in the new year, it makes such good sense. I'm not usually the biggest honey cake fan either but a friend brought one over last night that was seriously moist and delicious. I'll have to get the recipe from her! Your cake looks most excellent. Shana Tovah! 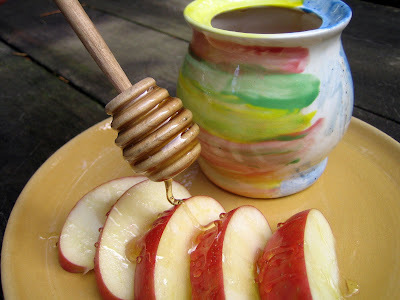 Have a wonderful holiday - l'shana tova! Hope you enjoy with your family. Thank you, Katherine! Mmm, sounds like your friend has a terrific recipe...time to start collecting ideas for next year. I'm always open to trying a new honey cake. Thank you, Lauren! I'm with you...you really can't beat apple dishes, both savory and sweet. Thank you, Lisa! We've enjoyed a wonderful holiday...time with friends and family and, of course, so much good food. btw, we are going to enjoy another one of your date honey cakes tonight. Thank you for a terrific recipe!